Today, India successfully tested the Agni-V, a long-range intercontinental ballistic missile capable of carrying a nuclear warhead. The missile has a range of over 3,000 miles and could potentially reach Beijing or Shanghai, China. This is not good. 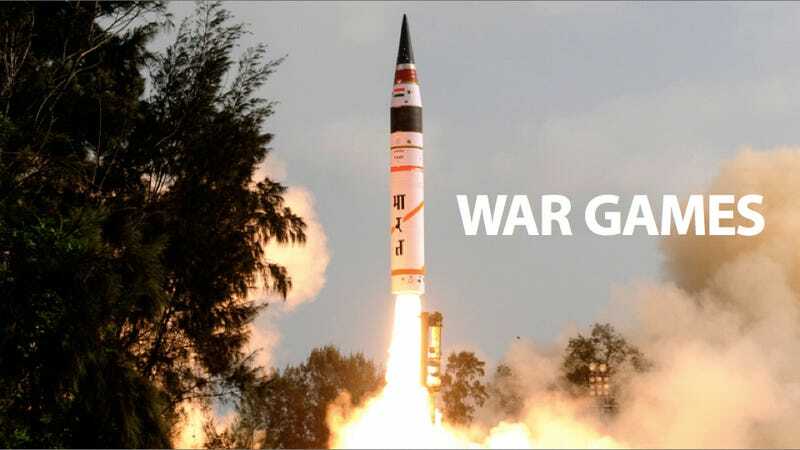 Many defense experts believe that India has developed this long-rage missile for deterrence parity with China, who has long had missiles that could strike India, and any other target within 6,200 miles. The two countries, though currently peaceful with each other, have long had a contentious history regarding their border. Developing a missile that could potentially reach all of China's biggest cities? That's the best future bargaining chip India could have. It's also, though, an escalation in an area of the world that's already far from stable. As for the missile itself, the Agni-V is 51 feet long, weighs nearly 50 tons, can reach an altitude of 430 miles, and cost around $480 million to develop. Even though the test was successful in every way, hitting a pre-determined target in the Indian Ocean, the Agni-V won't be fully operational—i.e. strapped with a nuclear bomb—until 2014. Oh and Agni is the Hindi word for fire. The development of the Agni-V marks a continuation of a new "arms race" that's happening in Asia. Every major country is loading up. China is continually increasing its military spending, South Korea has missiles that can hit North Korea, North Korea epically failed with their missile project but will keep trying even if their people starve and India has somehow become the top arms buyer in the world. Oh and they're also proud owners of the newest long-range, nuclear capable missile on the planet. Things aren't quite boiling in Asia yet but everyone is getting ready for when it explodes. Surprisingly enough, the one country in the region least affected by the existence of Agni-V is the one with whom India already has the most tension: Pakistan. The two countries have long bickered over the intermediate Kashmir region, and many think it's a question of when, not if, the two will come to serious blows. But since Pakistan is much smaller and the countries are closer, India's previous long-range missiles (the Agni I, II and III) already are capable of reaching it; the added range of the Agni-V doesn't really change anything, though it does give India the upper hand, significantly leapfrogging Pakistan's missile range of 744 miles. From what it looks like, the Agni-V is a defensive chess move made against China, not an agressive move towards Pakistan.